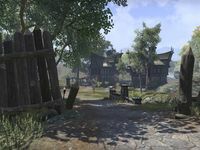 This article is about the abbey in Cyrodiil. For the crafting site in Grahtwood, see Temple of the Eight. The Abbey of the Eight is an abbey in southwestern Cyrodiil, west of Castle Black Boot. The Abbess is the leader of the Initiates that mill about the settlement. A few Knights of the Eight serve to guard the settlement, and the farmhand Gungrim will begin the related quest. A Skyshard can be found here. Distant Relatives: Get a message to Chorrol from the Abbey of the Eight. The Abbey of the Eight is seen in Oblivion as the Priory of the Nine. Prior to discovery, this location uses the Fort icon instead of the Town icon. ?